Walking along 59th street towards Central Park, a dog with a bright blue sweater and matching booties walked past. A safe distance away, my friend blurted, “Why do dog owners torture their dogs by dressing them up like that!? The dog must feel utterly humiliated!” I guess his rational is that dogs aren’t like people, and were designed to not need clothes. Since today was the first day of the year when I felt my nose hairs freeze up and my teeth ache from the wind chill, I wondered – “Do dogs really need coats and sweaters in the winter?” So I did a little research and it turns out that some dogs actually do benefit from having a coat or sweater to keep them warm. What I found makes total sense. Dogs that are small and have really short hair benefit more from wearing winter coats and sweaters. Chihuahuas, Daschunds and even Greyhounds are breeds that lose their body heat faster than the average dog. Puppies are also more susceptible to the cold. If your dogs is shivering a lot and suddenly stops – THAT’s something to be concerned about. 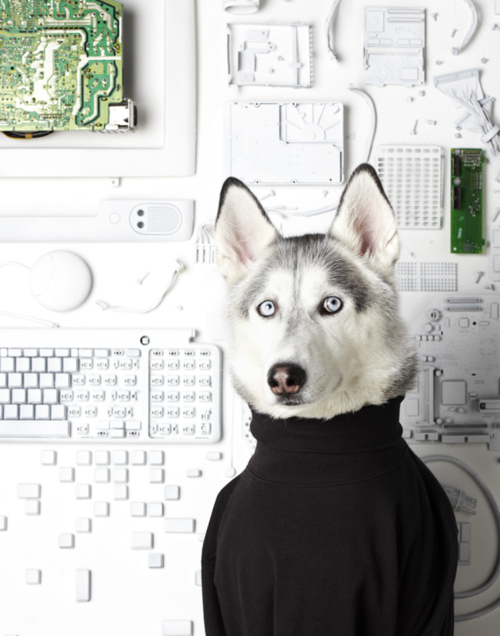 But a Husky wearing a turtleneck is probably a little over the top. What do you think Mr. Jobs? I know Apple isn’t the same without me. 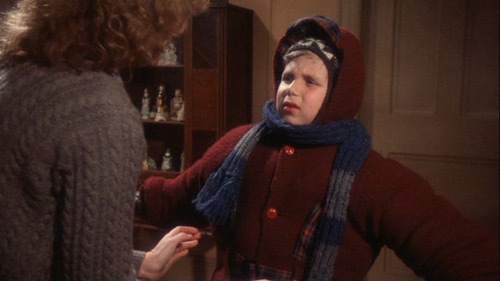 Unless you’re making them wear one in really high temperatures, putting on an extra layer for warmth probably won’t harm the dog, so if it makes you feel better to play it safe and don’t mind the extra steps before going on your nightly walk, looks like it’s okay. Still, I might avoid going overboard. Exhibit A. Imagine if a dog couldn’t ‘put his arms down.’ HIs belly laying flat on the ground. Also, older dogs, especially ones with arthritis, suffer from the cold much more than younger ones with healthy joints. So if you have an older dog, in addition to the outdoor coat, one might even consider getting them a heated dog bed or tucking them in with an extra blanket and after the goodnight belly rub. Or I guess one could try one of these? Hmmmm. 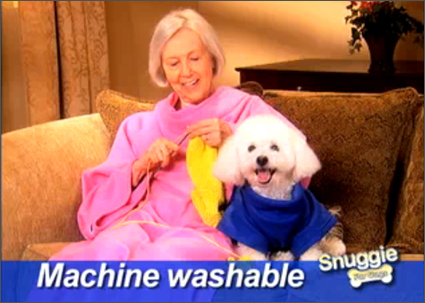 Is she knitting him a sweater to wear over his Snuggie? Especially when it snows, as much as dog booties make me giggle, they can protect your dog from tracking in salt that could contain impurities that you don’t want to be licked off their paws. I mean – I’m Asian, so I guess I would even make a dog take off their shoes before letting them into my apartment. There’s GOT to be a command that gets a dog to wipe their feet before coming into the house. Anyone seen it? If you’re looking for local New York dog community that share pet sitting favors and like the idea of a play date, why not check out Waggit? Hustling from breakfast in the East Village – I finally had a chance to stop by Whiskers Holistic Pet Store. I originally learned about it through a New York Times article and it’s been on my short list of places to check out. After a very impromptu walk in, I found myself plopped on a stool in a cozy corner of the store with one of their sales representatives, Joe. Being in the pet food business for over a decade, Joe didn’t hesitate to give me a crash course in pet nutrition. Here are some of the things I remembered from my chat with Joe. Just like people eat yogurt with pro-biotics because it’s good for our digestive tracks – pets should too. Probiotics help pets digest their food better. Supplementing your pets diet with fish that has omega oils is good for their joints. If you can, feed you pet raw foods. But if you don’t have the lifestyle where you can prepare raw foods every meal, that’s okay. There are easy recipes or pre- cooked frozen pet foods that can be good alternatives. Pet allergies and kidney disease is on the rise, in large part because of what we we’re feeding our pets. As much as Whiskers is a great place to learn about how to keep your pet healthy, it’s not a pharmacy. They provide recommendations on how to better care for you pet, but not medically treat your pet. Dogs naturally ‘binge and fast’. Which is why it’s not good to leave dog food laying out all day. The only thing a dog needs at all times is clean water. It’s important to not over feed your pets. Routinely feed them 3 small meals a day. That’s about it. You don’t want your dog to be another victim of pet obseity. It’s a rising trend in America. I totally get that it’s part of Joe’s job to promote products from the store, but I personally didn’t feel pressured to buy, I felt like his goal was to simply teach me things I didn’t know about pet nutrition. Joe answered all my questions and gave me some print outs of other resources worth checking out. With so much experience in the industry, Joe made me a believer in feeding pets good food, even if it costs a little extra. The benefits of a healthy pet diet can be realized with fewer vet visits, and of course – a long happy life with you and your pet! Whiskers has two New York locations. One in Manhattan, the other in Astoria Queens. New York hasn’t had a serious snowfall since Halloween, but it’s only a matter of time before we get pounded with the flight canceling, car burying, ‘my pants are soaked’ blizzard of 2012. So especially if you have a small dog, getting the right booties for him or her might be something you’re considering. Collaborating with the New York Times, Ada Nieves, the founder of the New York City Chihuahua Meetup Group, and her dog Cinnabon Bon tried out different dog booties and gives some helpful reviews on 5 very different dog booties. The pictures alone make this worth sharing. I wish I could get away with wearing boots like that. They look so comfy. While dog footwear might look like the sort of fashion indignity that Paris Hilton would inflict on Tinkerbell, it turns out that in winter it serves a practical purpose.